Stylish Star Allu Arjun will be making his Tamil debut with a Tamil-Telugu bilingual film under Lingusamy’s direction. This crazy project will be bankrolled by noted production house Studio Green. Incidentally, Studio Green is a home banner of Tamil star brothers Suriya and Karthi. Here’s an interesting tidbit. 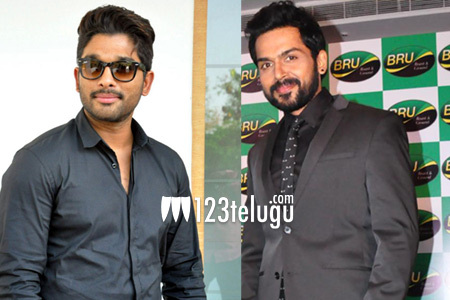 Karthi, who was in Hyderabad yesterday for an event, revealed that he came to know that Bunny was his junior at school. Karthi went on to express his happiness on producing a movie with Bunny on his home banner. It is well-known that Bunny lived in Chennai until he turned 20 and then moved to Hyderabad to pursue his dream of becoming an actor.